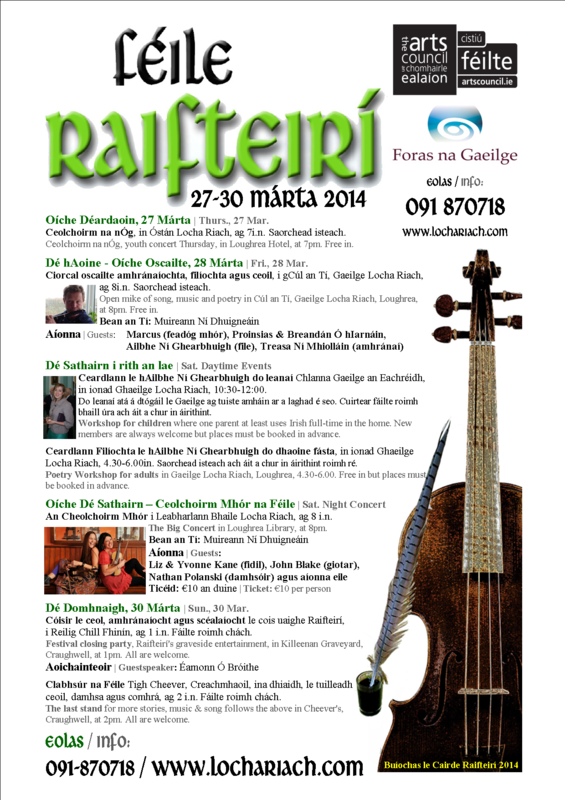 Duais Náisiúnta Ghlór na nGael 2014, the Glór na nGael National Award, was awarded to Comharchumann Mhic Dara, an Cheathrú Rua, Co. Galway, at the weekend. Irish language committees and groups from all over Ireland and overseas gathered in the Clontarf Castle on Saturday to celebrate their achievements in the preservation and promotion of Irish in their communities. Minister of State Dinny McGinley congratulated all the organisations who took part and awarded over €120,000 in prizes to community groups, school groups, universities and groups from Scotland, Canada and America. Speaking at the ceremony, Minister of State McGinley said the Glór na nGael awards goves recognition to the invaluable work of Irish language groups, to the sponsoring bodies, and he praised the relationships between those bodies and Gló na nGael. While most of this year’s winners were announced in February, the winners of Duais Ghlór na nGael and the Third Level ccmpetition were not announced until Saturday’s ceremony. On the night, a cheque for €20,000, sponsored by the Department of Arts, Heritage and the Gaeltachta, as well as the Glór an nGael trophy, sponsored by Foras na Gaeilge, were awarded to Comharchumann Mhic Dara for the first time. It was also announced that An Cumann Gaelach, Trinity College, came in first place in the Third Level competition and taking home a cheque for €2,000 for the third year in a row. Sir , – A language lives by being spoken. There was a time when Latin was a common school and university subject. In its study, grammar and literature were emphasised, but at the end of the process few, if indeed any, could communicate in a functional way in the language. Too much of this method was transferred to the learning of Irish, and it produced similar results. In my mid-50s,while working in Vienna, I attended German language courses for a mere two hours a week over a four-year period. German literature was not touched on and from the start, with students of various linguistic backgrounds, German was the only language spoken in class. Tests included comprehension questions on oral recorded passages, usually spoken in strong local accents. At the end of this short period of study I was functional in communicating in normal situations such as shopping, in restaurants, and staying in B&Bs throughout Austria and Germany where, in many cases, the owners spoke no English. Incidentally I was also able to read with pleasure several German novels and English-language novels in translation. Illiterates can and have throughout the centuries kept languages alive. Study of literature is important but if we are to use Irish as a spoken language the ability to communicate comfortably has to take precedence. A Chara, – While it is apparent that there are diverse opinions on the Irish language, it is clear that Irish-speakers are demanding parity of esteem, and what is wrong with that? What is striking is the negative attitude of some letter-writers towards the language. Daniel Stanford (March 27th) proclaims to all and sundry that he could not read a letter by another reader because “it was in Irish” and that if this practice became widespread he would have to stop reading The Irish Times . Why would someone bother to take the time to write to a newspaper to announce his ignorance of another language? It would also seem unlikely that The Irish Times has any plans to launch as an Irish language newspaper. I think Mr Stanford and any other anxious readers can rest assured that their preferred monolingual world of journalism is unlikely to be disturbed. The grand finale of Siansa Gael Linn will be broadcast live from in the National Concert Hall on Raidió na Gaeltachta on Sunday, 6 April 2014. Siansa Gael Linn is a competition aimed at young traditional music and singing groups organised and the competition has being goin from strength to strength since it was first held in 2001. The eight groups who will perform on the night are ‘Iontas’, Coola Post-Primary School, Riverstown, Co. Sligo;‘Cóiriú’, St. Mary’s, Grammar School, Magherafelt, Co. Derry; ‘Na hÓgánaigh’, Coláistí Eoin & Íosagáin, Booterstown, Co. Dublin; ‘Na Rógairí’, Coláiste Cois Life, Lucan, Co. Dublin;‘Glór Mhaigh Eo’, Castlebar, Co. Mayo;‘Ceoltóirí Chnoc na Gaoithe’, Tulla, Co. Clare; ‘Lasair’, Mallow, Co. Cork and ‘Trioscar’, Co. Waterford. Each group will perform their own ten to twelve minute selection of traditional music and song on the night in what promises to be a fantastic concert. The winning group will be awarded the Gael Linn trophy and a cheque for €2,500 with €1,250 going to the group in second place and €750 to the group in third. The top three groups will also release a CD of their winning performances and the winners will be given the opportunity to play events such as the Temple Bar Trad Fest. Tickets are available for €12 (€6 for students) from the National Concert Hall, 01-4170000 or www.nch.ie. The final of Siansa Gael Linn 2014 will be broadcast live on RTÉ Raidió na Gaeltachta, presented by Áine Hensey, on Sunday, 6 April, at 7.30 pm. The independent production company Red Shoe Productions will record the event which will be broadcast on TG4 on Wednesday, 23 April, at 9.30pm. Siansa is organised by Gael Linn with support from Foras na Gaeilge, RTÉ Raidió na Gaeltachta and Irish Music Magazine. At the Glór na nGael national awards on Saturday night last a cheque for 1,000 euro was presented to the Cumann Gaelach from Marino Institute of Education as the best Cumann Gaelach in its category among third level institutions. Four hundred guests were in attendance and the presentation itself was made by the Minister of State for Arts, Heritage and the Gaeltacht Mr Dinny McGinley T.D. to Sarah Breathnach, Nora Ní Mhurchú and Paula Melvin. We congratulate them for gaining this recognition for all the work they have done since the beginning of the year and for the work that the Cumann Gaelach has done in Marino over the years.